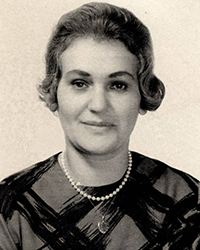 Olga (Steinberger) Bowman was born on April 8, 1927 in Pacin, Hungary. She grew up in a Jewish home with her parents, older twin brothers and sister. In 1942, Olga left her family to go to school in Budapest. In 1944, she was forced into the Budapest ghetto. Along with hundreds of others, Olga was sent on a death march to Dachau then Ravensbruck and Oranienburg concentration camps for slave labor. Olga was liberated in May 1945 by the Soviet Army. One of the liberating soldiers became her husband. Learning Olga’s entire family had perished, they immigrated to the United States in 1949 and had two sons.